Our imaginary fantasy trip across Africa has taken us to some amazing places as we proceeded west along the map starting out from the micro-continent of Madagascar. Exploring the continent on the internet has really made me want to visit someday! Through photos and descriptive writing we have seen the great lakes of Malawi and Tanzania. We have lingered in the terrifying yet astonishing rainforests of the Congo. We have marveled at the unprecedented ugliness of the flags of Mozambique and Angola (sorry, flagmakers). At last we come to the ancient Namib Desert. Beyond it lie the cold waves of the Atlantic Ocean filled with nutrients thrown off from the mighty Antarctic circumpolar current. It is one of the most jarring juxtapositions on Earth—the rich freezing waters of the sea pound against the burning arid dunes. As you can tell, I have a fascination with the Namib. If I ever win the lottery or suddenly find a bag of gold or gain a million internet followers [crickets chirping], I will make it my business to go there at once. 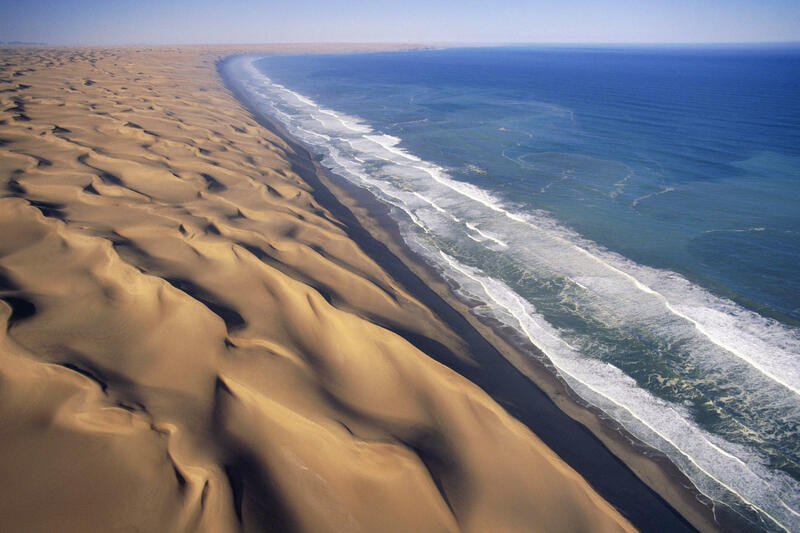 The Namib is the world’s oldest desert. As the continents dance all around the globe and their landscapes change from forest to ocean to plains to mountains to glaciers, the Namib has somehow stayed a wallflower and kept its dry desert climate. Its climate has been largely unchanged since the time of the dinosaurs, which is why it is home to oddities like the welwitschia and the sandswimming golden mole. Namibia’s human history recedes into the remote mists of prehistory (humankind is after all from Africa). Various groups of people arrived in the desert in waves. The San, Damara, and Namaqua—hunter-gatherers, then herdsmen—arrived. Then the farmers of the great Bantu expansion showed up in the 14th century. Contemporary Namibian history is more tragic—since the desert land was caught between mighty colonial powers of Germany and Great Britain. Great Britain took the most useful natural harbor and Germany took the rest of Namibia—although the native Namaqua and Herero tribes rose against the nascent colonialists. From 1904 to 1907 the Germans wiped out approximately 10,000 Nama 65,000 Hereros in one of the twentieth century’s first genocides. The surviving tribespeople were relegated to concentration camps and unlivable ghettos. 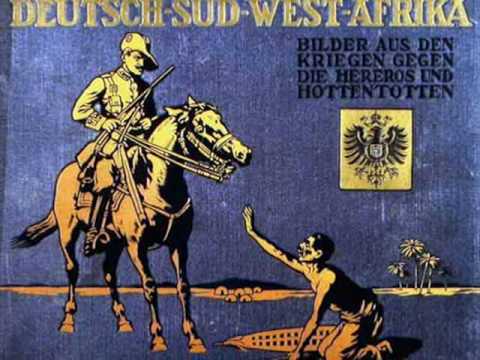 When the Germans lost World War I, Namibia passed to de-facto South African control. South Africa administered the territory somewhat informally (and brutally and badly) until a variety of incomprehensible UN mandates, international pressure, and a scrappy (though morally gray) guerilla independence movement forced the apartheid government of South Africa to grant the nation independence in 1990. Contemporary Namibia has abundant natural resources (which are managed with greater fairness than in neighboring states), but it has suffered greatly from the scourge of HIV. Additionally the single political party SWAPO (which evolved from the aforementioned scrappy independence fighters) is run by a somewhat opaque politburo. 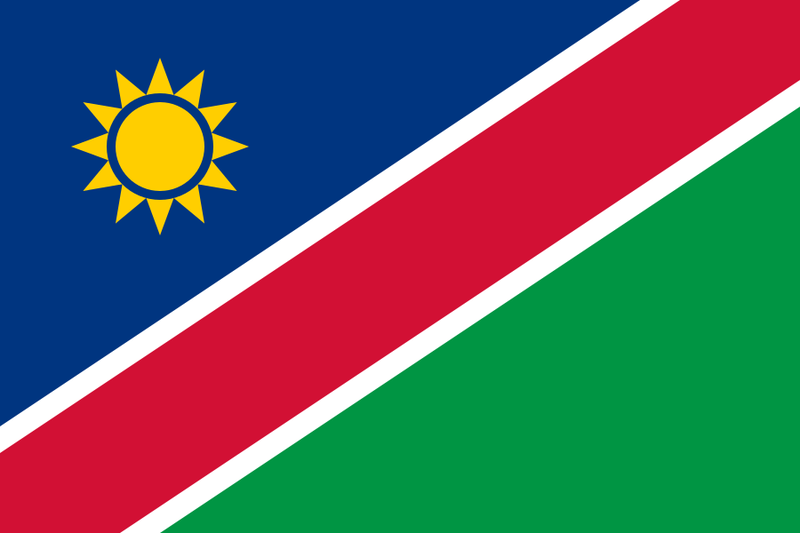 The flag of Namibia is based on the flag of the national liberation movement. It was chosen by the chairman of the subcommittee for flag creation who reviewed over 800 designs before choosing the current flag. The colors have symbolism not dissimilar to other African national liberation flags. Red represents the people of Namibia and the blood they have shed to make a nation together. White is the color of unification and peace. Green represents farms, agriculture, and ecology. Blue represents the ocean and the life-giving freshwater which is so rare in the desert. The sun represents…well, the sun…the source of all energy and life (although political junkies might speculate that it also is a homage to the sun of the Kuomintang).